This story is about a boy who meets many people and the majority of them play their roles and leave the protagonist. 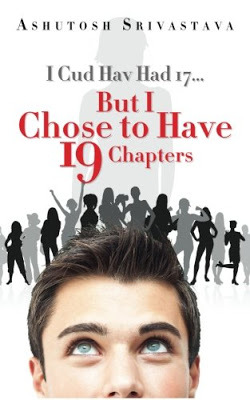 “I Cud hav had 17 but I chose to have 19 chapters” is a chick-lit kind of story that portrays the emotional turmoil that a young boy goes through. Love is never planned. It happens by chance. Rudra wishes to have a partner, who loves him and cares for him. He meets several girls but some of the other kind of intrusion always makes his story end on a wrong note. Will Rudra find his love? Will he become ‘the one’ for someone? Grab the book to know more! I am really disheartened after reading this book. Although I never start my reviews on a negative note, this book has nothing constructive to offer. As I have been saying repeatedly, ‘Not everything needs to be told to everyone’, this book is more like a narrative composition where the author is trying to voice out whatever he has jotted in his diary. The story is baffling and vague. The title of the book is too long. It was not at all required. Longer titles are not always catchy and this one has spelling errors too. The author has explained the reason for using two different spellings for Have and incorrect spelling for Could but the reason sounds illogical. The back cover of the book is overloaded with information. Ideally, the author’s photograph could have found a place on a separate page inside the book. But I am still wondering why the cover designers chose to keep the blurb, author’s introduction, and his photograph on the same page. Moreover, the author introduction is more like reflective writing. The ink is too light to be legible. The use of different font style also acts as a negative. Overall, the back cover spoils the first look of the book. The blurb is a little confusing. It could have been made shorter and more precise. The cover of the book is alright. The font (style and size) is fine. But the use of different fonts for the titles and the extensively long chapters makes the botch of it. Another drawback is the inclusion of monologues in the chapters. The reader might end up searching for the plot as the narration is all about why the author is penning down the story. The amalgamation of present tense with the past is a big goof up. This diverts the reader’s attention time and again. And like I said before, the content feels more like a diary narration. The very first thing the readers opt for reading in the book is either the blurb or the author biography. Once you read the author bio in this book, it is clearly evident that the author is the protagonist himself. This might not be a problem for the majority. But somewhere in the subconscious mind, the usage of different name kept haunting my mind. The use of incorrect grammar and incorrect sentence formation can be a reason for the dip in interest level. Overall, the book could have been made better. This book is not the one that you would want to adorn on your bookshelf.